With registration topping over 200 people the scene was very much set for the exciting collaboration platform that is the eHealth Ecosystem. Opening the day, Kevin Conlon, Dept of Health gave us the definition of the Ecosystem as being the convergence of Government, Academia, Industry and Health with the patient placed firmly at the centre in terms of the realization of benefits from improved safety, efficient pathways of care and access to treatments. The level of expertise at the event, incidentally, crossed Department of Health, HSE, innovative health technology suppliers, hospital chief pharmacists, dermatologists, nurses, academics, GPs, and software engineers, all facilitated admirably by HISI and ICS personnel - albeit in a room whose temperature continued to rise throughout what was the hottest day of the year thus far. Nevertheless, the attendees’ passion for the subject matter declined to succumb to the heat! HSE CIO, Richard Corbridge, clearly thinks so. Having been introduced to the audience by Mr. Conlon as a gift that arrived in the HSE shortly before Christmas, Richard responded in his opening speech by saying that he had very quickly realized that he needed to be wrapped and ready to deliver from Donegal to Dingle, and everywhere in between, and all in one day…! Santa Claus indeed…!! He elaborated on the concept of the Ecosystem as being everyone in attendance, each of whom he predicted would have a different concept of what an Ecosystem actually is by the end of the day. Since the Ecosystem has to be different things to different people, this would actually be a good thing as each would bring their version of events back to their own area of expertise. The eHealth equation pits an aging population alongside technology advancement, health reform and clinical engagement. Clinical engagement in Ireland, says Richard Corbridge, is better than he has seen it anywhere in the world, giving the example of the 64 volunteers who have joined the first Council of Clinical Information Officers to further the eHealth strategy. He also spoke to a very appreciative audience about the fact that this generation will probably be the last without some form of clinical implants. Project UnderSkin by TickerFit is researching the possibility of an implant under the thumb that is programmed to monitor certain health indicators, blood sugars, temp, heart rate etc. and displays a hieroglyph on the skin based on its findings… alerting people automatically for example when blood sugars are dropping below safe levels. He went on to outline the various deliverables of the Knowledge and Information strategy, prompting some attendees to tweet about the busy summer he had ahead! Peter Connolly, HSE’s Head of Enterprise Architecture, then spoke about realizing the Ecosystem via Enterprise Architecture. What he is designing via the newly established design authority for the HSE is a robust and resilient architecture that will be able to support the eHealth strategy. Dr. Aine Carroll - HSE, Presented a hard hitting set of statistics, admitting that she was there to bring everyone back to earth with a bang! “The healthcare system is hazardous... more hazardous than flying, driving & bungee jumping! We need to fix that… and technology is the way to do it. She also re-emphasised the key message from the day: A common language, ie establishing standards between organisations and systems is imperative. Brian O’Connor – ECH Alliance in finding himself introducing people in attendance who should already know each other, re-emphasizes the fact to him that we need an Ecosystem. He outlined the key ecosystem priority areas and gave some excellent and authoritative insight into the experiences he has had with ecosystems across Europe, China and Canada, inviting speakers from the floor to underline their own experiences. In the afternoon we had a number of presentations around emerging opportunities. Amanda Green from Cerner spoke about how the emergence of viable markets will require open standards. Smartplatforms.org is a site hosted by Cerner which promotes collaboration across borders. Nicola Mountford, Director of UCD Connected Health, explained the range of activities undertaken in the academic community, including ARCH and Insight, in support of eHealth in general and ePharmacy as a case in point, in collaboration with the Ireland East Hospital Group. 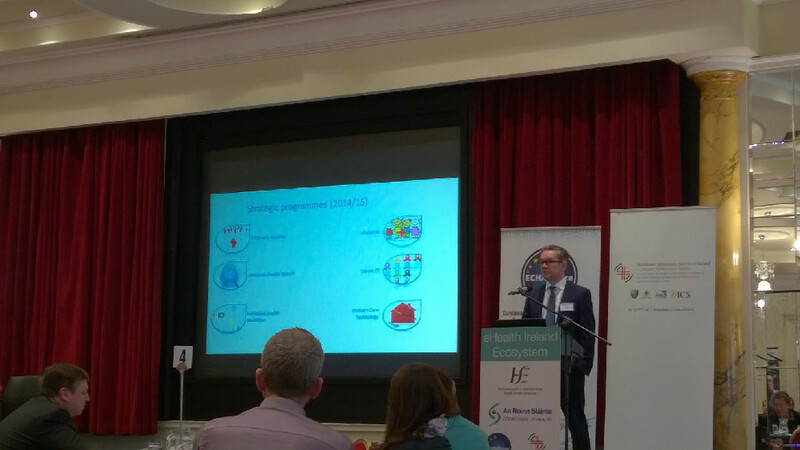 Keith McLernon spoke about the ePharmacy and digital pharmacy solutions that they have available and in Mallow they are piloting an ePharmacy solution using HL7 standards, which will reduce transcription errors, improving patient safety. Helen McBreen NDRC highlighted the innovative companies present like TickerFit, Medxnote etc., who have come through the NDRC innovation centre and have achieved real success with their technologies and solutions. As investors the NDRC are looking for Global opportunity in innovation (“not tech for tech sake, not solutions to local problems”) they are looking for technology projects that are not easy to replicate… and they are looking for teams who can work together to share the challenges that need to be overcome when you are setting up a company. Volunteers attended a Future Health workshop, 10 -15 ideas that could be turned into businesses. MDTs worked together over 7-8 weeks to validate the problems they proclaimed existed, and build business cases around those. It is difficult to get people to articulate and believe in their ideas. Describing what the problem is first before attempting the technology that will solve it, is often what the NDRC is more concerned with. Mary Cleary, ICS: The reaction to the day has been extremely encouraging. The wide range of topics and concerns and questions raised by attendees can clearly be resolved in the collaborative environment of an ecosystem. Michael Tighe, HISI, I’m extremely proud to have gotten to today. It is something we’ve been working towards for 3 years. Paul McCarthy, Full Health Medical Ltd. www.fullhealthmedical.com : A great day. We work in the area of preventative health and enabling people to understand their test results. eHealth has the ability to improve this. If the Ecosystem succeeds and brings all of the innovations that are out there together, patients will be the real winners and tax payers will benefit from the savings. Mike O’Keeffe: Insight Centre UCC: Very informative and a very attractive opportunity for all involved.